"Meyer" is a variant of "Meier" mostly used in northern Germany, a family name with roots stemming from the latin "maior" or "maius", originally used to describe the administrative official in charge of ownership and land use rights around the time of the 13th century and later used to describe the actual landowner/person with the right to use a specific parcel (actual ownership of land typically was vested in the local nobility or the church. Alternatively, there was a brief period of Germanization of jewish names in the 18th century, when "Meir" (enlightened) was converted to the by then common name "Meier"/"Meyer". My last name (which is nowhere near common enough to make this map) is usually found in people of German Catholic origin. But I inherited it from Jewish ancestors. RE: Your Texas question: Looks like they used digitized phone books for their research. West of the Mississippi, ignoring the abortion of the left coast ;^), most places do their phone books in a "metro" edition, which (for instance) lumps everybody within 50 miles of San Antonio together into a single phone book under the name "San Antonio". I suspect that east of the Mississippi towns tend to each have their own because those towns are usually bigger than out west. Just a guess based on the distribution in Texas and what I know of the phone networks here. On the lack of granularity in Texas, If you follow the link and read the legend, the map only shows the top 25 surnames for each state. 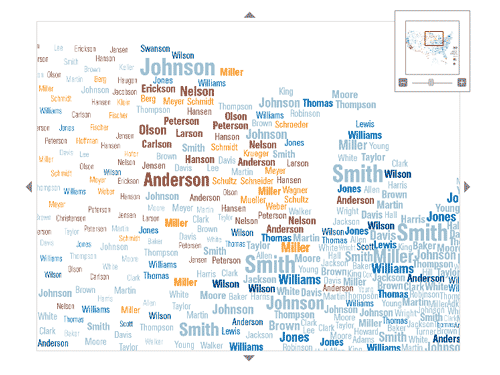 Of course the names will be more spread out for a physically large state like Texas. Matt: Ahhh, I missed that. Dumb me :^). Well, Northern Germany was for some time closely related to English Empire with one of their duke's being in the lineage of the English crown, so perhaps that's why they think it is an English name ;) There actually still exists an old descriptive in German, that has your name in it: Hausmeier (something like the owner or at least manager of an appartement complex). If it's in Iowa, it's German. My 2nd cousin (non-German) growing up in small towns in central Iowa during the sixties would sometimes be the only kid without blond hair on the basketball court during high school games due to the overwhelming German and Dutch ancestry of the area. in the arrowhead of MN.